Last week, I mentioned that I was in full on canning mode and kicked the season off with 4 gallons of blackberries. It wasn't only blackberries that were being dealt with, I also found three bags of various pits and peels that needed attention so I made 12 1/2 pints of apple pie jelly (recipe next week), 10 1/2 pints of peach and jalapeno jelly, and 11 1/2 pints of pear jelly. 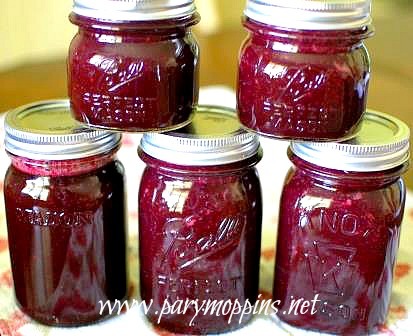 As promised, here is the recipe for blackberry syrup. This syrup can be used on pancakes, in drinks (blackberry lemonade anyone? ), tossed with a fruit salad, poured over ice cream; it's pretty versatile really. Put berries and water in a big stainless steel pot and cook down until berries are squishy. Next, strain the pulp from the juice. I used a colander to catch the bigger chunks and then cheesecloth in a colander to catch (most of) the seeds. Rinse out your stainless pot to get any residual seeds sticking on the bottom and sides. Pour the juice back into your now clean pot, bring up to a boil and add sugar. At this point taste it to see if it's sweet enough for you. If not, add another cup of sugar. Stir until the sugar is melted. Bring up to a boil for 1 minute. Cut off the heat. Ladle syrup into hot jars. Thanks Miz Helen for the feature! Blackberry lemonade...right on! I'm going to think about that all night. It would be a great accompaniment to your beautiful fig salad that still makes me swoon.